Brick and Clay have timeless beauty, with baked-in color that will never fade. Many styles and patterns are possible. With a wide variety of brick and Clay in stock, and access too many brick or clay products, our expert staff can help you select and deliver the perfect brick and clay whether you are matching an existing brick, clay or building new construction. At Island Block and Masonry Supply we offer many different styles and variety’s of brick and clay products, give you the choice of many different options to pick the exact brick or clay products that looks perfect for the job that you are working on. 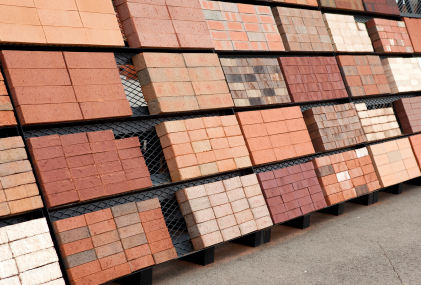 We offer only the highest quality and guarantee full satisfaction when purchasing any brick or clay product from us. We have been servicing the tri state area since 1947 because of the variety and quality of our products and we stand by them otherwise we would not carry them. Always remember when you are in need of any brick or clay for any home or commercial construction make sure to stop by us, Island Block and Masonry Supply located at 21 W. Booker Ave Wyandanch, NY 11798 or give us a call at 631-443-4521, were here with knowledgeable professionals to answer any of your questions. Concrete paving stones can be used for walkways, patios, pool decks and driveways or loading docks. Benefits of paver over asphalt and poured concrete include high compressive strengths, pleasant look, time saving, easy removal and relaying. When considering which Wall Brick to purchase take into account Color, Texture, Mortar, and Soil Matching. Solid brick are used where holes may be unsightly, for example, in steps or window sills. The surface texture of brick is very important to its overall appearance. Concrete bricks with sand aggregate can be made using a simple machine and a basic assembly line. Similar to Concrete Block but pressed more densely and are usually smaller in size. They can come in a variety of colors and can be made in a all shapes and sizes. We believe in a higher standard of quality for the environment so when the job permits or if the customer wants a high quality stone or brick that has been recycled, we can say with pride that we can service that need and feel good about the environment.